4.0" x 3.1" stitched on 14 count. 3.1" x 2.4" stitched on 18 count. 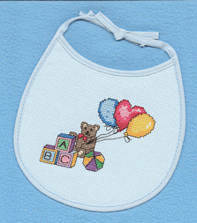 Alphabet Bear Bib cross stitch pattern... Design is stitched on a pre-finished 14-count Light Blue Aida cloth. Complete stitching instructions and supply list are included. A web link for purchasing the bib online is provided.